Preface The Indian retail landscape is changing rapidly and for the better. Retail industry one of the largest sector of the Indian economy, which is also considered as the largest employment provider. An important aspect of the current economic scenario in India is the emergence of organized retail. There has been considerable growth in organized retailing business in recent years and it is poised for much faster growth in the future. Ma jor industrial houses have entered this area and have announced very ambitious future expansion plans. Indian retail never attracted large business houses and ma jorly focused on niche product segments and luxury goods. Multi-brand retail comes in different formats like supermarket, hypermarket, compact hyper and the ubiquitous mall. MBO’s on the other hand were typically a more traditional way of growth of retail in India. The success of this sector is best reflected in the fact that the shares of retail companies are well represented in all top mutual funds. MBO’s ma jor advantage over its competitors in the retail sector has been its unique understanding of the Indian organized retail market with all its quirks, shortcomings and challenges. By creating a retail business from the ground-up and expanding rapidly, thee MBO’S are starting to follow the standards of that of the international format. Most of their experiments have proven to be successful and MBO’s continues to experiment while expanding existing ventures. From men’s wear the company has moved on tointroduce furniture, sportswear, kitchen appliances, food, electronics and children’s apparel. The competitors do have the opportunity to learn from the experiences of India’s largest retailer, but the experience that comes with managing these diverse retail formats in the Indian scenario is something that new entrants will have to learn on their own. fter globalization there has been a vast change in Indian retail market. Like International markets, the concept is rapidly growing in India too. Consumers buying preferences, taste, choice has changed and have become more quality conscious. As price sensitivity is no longer persistent in customers' mind-set, brands are now going about pushing sales more in a MBO format and thereby giving a touch edge to competitors retailing via EBOs. Competition has become a double edged sword. Malls had, in the recent past defined the way of middle class shopping. Nowdays, MBO franchising has started gaining ground as consumers like to pick from a wide option of brands with varied price points. Multi-brand franchising has come a long way in India and many players have jumped in. Leaving the exclusive brand outlet (EBO) concept behind, MBO franchising has now cemented its g�ound in busy locations such as high-st�eets and malls. Their positioning is very Indian oriented, keeping the Indian mind-set in mind, their shopping mentality. The advent of globalization has made it essential for retailers to be on their toes always. They have to design, and redesign their retail formats, and come up with creative customer shopping experiences. Retailers need to adapt innovative formats to meet customer preferences. MBOs drive more footfalls as compared to EBOs as they display a mixed bag of brands at varied price points. The famous MBOâ&#x20AC;&#x2122;s Shopperstop, Pantaloons, Westside, Max put special emphasis on their VM, as it is one of the most important tools for attracting customers, and are gaining more popularity with the consumers. In proportion to an MBO, a brand spends considerably larger amounts on marketing activities such as print ads, television ads, etc. They try to best to be different and unique in their own way. They try to make it convient for a shopper to shop. These stores have a zone levels - A B C, where A being the wall, B being the display table, and C being Gondolaâ&#x20AC;&#x2122;s. On A they display their latest merchandise, B they display their best selling merchandises, and C they display their cut sizes. 0 -35 yrs More cautious about the product. They look for the product as well as the price. Not much worried about the service quality. 36 -45 yrs Look for value and service quality as they are more cautious about the value added service and quality. Do not like to experiment with the product. Prefer to stay in their comfort zone. PANTALOONS Pantaloon Retail (India) Limited is India's leading multi brand retail formats in both the value and lifestyle segment. Pantaloons was launched in Kolkata in 1997. Pantaloons is one of the fastest growing lifestyle apparel retail destination in India and cater to every consumer needs across multiple occasions. Pantaloons retails over 200 brands which comprises a mix of exclusive brands, licensed brands, international brands and more in apparel as well as accessories. Pantaloons also has a well established partner brands such as Lombard, Bare Denim, JM Sport Classic, RIG, Turtle, Spykar, Lee Cooper, 109F, Global Desi, Biba, Giny & Jony and many more. As per observation, Panataloons have different window themes according to the season. Pantaloons uses CFL lighting to promote their merchandise. The music played is appealing to the customers, not too loud. Seasonal Discounts, Sales Discounts during Festivals are offered to attract consumers and put up throughout the stores with the store name on the signages. Pantaloons, other than apparel have a lot f products to display in the stores. Pantaloons offers a wide range of brands for men, women and kids with choices across categories including western wear, ethnic wear, formal wear, party wear, and accessories making it a one stop destination for all the fashion needs. 6 months-35 yrs More cautious about the product. They look for the product as well as the price. Not much worried about the service quality. SHOPPERSTOP Shoppers' Stop Limited is a chain of Retail stores in India owned by K. Raheja Corp. Shoppersstop today boasts of 27 retail outlets across the country. Shopper's Stop has become the highest benchmark for the Indian Retail Industry. Shopperâ&#x20AC;&#x2122;s Stop is a household name, known for its superior quality products, services a complete shopping experience. Shopperâ&#x20AC;&#x2122;s Stop is known as Multi-Brand retail outlet because of their verity of Products. They offer various products like apparels, Accessories, Toys, Fragrances, Beauty Products, etc. under one roof. It spans an aggregate acquired area of 11 lakh sq.feet. 177 stores in 18 cities with 3.4 million sq ft space across 8 formats. As observed in the store, Shoppersstop tries to make its windows look different and unique from others. They use different props to to convey their message. They types of fixtures used in the store are according to the products displayed. They follow a proper colour story in displaying their merchandise. The music played is very soft and appealing to the ears. They reach out to the customers through : Sales Promotion, Gift Vouchers, various festive offers. Shoppersstop's sister stores are: Crossword Homeshop, Hypercity, Mac, Mothercare. 16-35 yrs Caters to complete family segment. Targets lifestyle oriented segment. WESTSIDE Established in 1998 as part of the Tata Group, Trent Ltd. One of India's largest and fastest growing chains of retail stores. The Westside storeshave numerous departments include that Menswear womenâ&#x20AC;&#x2122;s wear, Kidâ&#x20AC;&#x2122;s wear, Footwear, Cosmetics, Perfumes and Handbags, Household, Accessories, lingerie, and Gifts. Westside has carved a niche for its brand of merchandise creating a loyal following. With a variety of designs and styles, everything at Westside is exclusively designed and the merchandise ranges from stylized clothes, footwear and accessories for men, women and children. 36 Westside stores measuring 15,000-30,000 square feet each across 20 cities. MAX FASHION Founded in 1973 with a single store in Bahrain, the Landmark Group has successfully grown into one of the largest and most successful retail organisations in the Middle East. Established in 2004 in the UAE. Max window display talks about the current theme during that season. Different props used in windows depending on the size of the store. While styling the mannequin they use mathing accessories tocomplete the look. In India, MAX was established in the year 2006 with its first store in Indore. Focussed lights are used in the windows to higlight the merchandise and the store is brightly lit from the inside. They have different fixtures for different merchandise and the number of fixture depend in each department. Max follows a colour story throughtout the store as well as in the windows too. They arrange their merchandise sizewise. ADVERTISEMENTS are among the most well-known sales promotion tools, but others include special displays, coupons, promotional discounts, contests, and gift offers. First impression are formed within the first ten seconds. Customers remember vividly the worst impression, not the best impression. Shop window displays have become an essential tool for catching the attention of potential customers. Brands like Pantaloons, shopperstop, Max fashion highlight their trends or any festival through their windows by using different props. “The cycle of changing their window display is after either 20-25 days or sometimes twice in a month based on the promotional calender. MBO’s deals based on the visibility and size of the facade as well as window displays”, says Sachin Rana, Area VM Head, Shopperstop. Facades and store windows are now considered a serious communication tool from the brand’s point of view. These MBO brands know the observing power of the customers so well that they try and revolve their theme not only around the store but also their target customers. “ To highlight the lat�est t�ends in the store, we use the window display or the focal points, and new merchandise are hightlighted on the walls. says Var�n Nair, Visual Merchandiser of shoppersstop, Mumbai. Visiting stores like Max Fashion, Shoppersstop, Pantaoons, Westside are seen making unique different window displays duing the sales period or during a season launch and they spend a lot in making their window display look different from one another. They try to match their standards to that of international brands. The interesting thing was the window had a live fashion model, wearing an outfit that came out of a small loom being operated behind the window by an Indian weaver. These brands do try to make their window display match up to that of International brands. During sales or festive time, their windows only speak about their display and use different elements to convey their message. Depending on the layout of the store, there are different types of window displays for different stores. Usually stores like Max, have open windows as well as enclosed window and stores like Pantaloons, Westside, Shopperstop have mostly open windows. Enclosed Windows: These windows have a fully solid wall behind them, two side walls,and a glass in front. These windows can have as many props as they wantand make their window intresting. Open - Back Windows: They usually have little formal display, merchandise shown in the store interior becomes the display. The advantage to this is the customers would know what kind of merchandise does the store have. are very “Mannequins much in vogue today. Their mannequins are not as styled as the international brands, but they do style the mannequins according to the theme and style it with matching accessories and garments. Through my obsevation, these stores try to style their mannequin in such a way which when a customers sees the mannequin, they can see the type of merchandise matched with one another. The size of the merchandise vaires for the mannequins. Sometimes the right size of the dress or top is not been put on a mannequin and it does not give a good look to it. To make it look properly fit they put a clip at the back of the dress to make it stay perfectly on the mannequin which is wrong as it shows a wrong picture to the customers. Many of these stores to save up on buying a good mannequin the stores always display the mannequins with no wig or no head. Keeping this mind, I have mentioned a few guidelines for the dressing of mannequin displayed in the window or instores. Guidelines for Dressing a Mannequin 1. Mannequin. Always put accessories on the Mannequin to make it look complete e.g. necklace, hand bag etc. Wigs (if applicable) Attach it to the head so that the hair falls in a natural way. Brush the wigs with a wide tooth comb. Techniques for positioning mannequins in Windows While setting up the window display, they select a color story which matches with the theme. Usually 3 - 4 mannequins per window would represent each window or could be 1 depending on the size of the window. These mannequins are styled to match to expect to see a full outfit down to last fashion accessory- including the shoes. The MBO’s mostly have the mannequins remains on its supporting rod. No hard tag on Mannequin merchandise. It is mandatory to iron all merchandised before they are worn on mannequin/Bust forms/Torso. Price point tag should not visible. Ensure no dust on merchandise on mannequin (check it every day floor walk around ). Focal points & Bust form mannequin's merchandise should be displayed next to it. Ensure proper merchandise worn on mannequin, for e.g. Button should be closed properly, zipped denims, Inner should be displayed on proper manner etc. The Tips of Window Display 1. Select a merchadise category, like Ethnic wear. 1. manage throughout an entire span of windows. Select a colour story: A colour that is bright and eye catching. Choose just one colour group for the window. Select props: If its Diwali theme, use of diyas or lights or a cut out of crackers. Select mannequins: 3 to 5 per window, rarely more than 5 if the window is huge or 1 if the window is a coner window. Per window would include both genders as well as the kids and different posses. Select prop that makes sense with the theme. Think about what goes naturally 2. with the merchandise you are promoting. Prop choices should be limited for the sack of impact and clarity as the merchandise on the mannequin should be the main highlight. Merchandise should always be more 3. important than the props. Use props which ainâ&#x20AC;&#x2122;t to loud for the eye and which do not distract you from the theme. Do not mix different materials together. If plastic, make sure you donâ&#x20AC;&#x2122;t add 4. using another material which is opposite to plastic. It should be in the same family range. How will you know which tools to use? Colour - king of Visual Merchandising These stores always maintain a colour story while displaying their merchandise instore or in the window, the mannequins are dressed in the same colour theme. Colour is accepted as the biggest motivation for shopping. People buy colour before they buy, size, fit, or price. â&#x20AC;&#x153;Colours says something about the kind of merchandise. Colour psychology is very important in visual merchandising.â&#x20AC;? says Varun Nair, Area VM Shopperstop Colours can immediately create a mood. Through my research, as all the merchandise does not come in the store most of them are cut sizes, or as many of the merchandise planned are as per the planogram do not come. The only way to display the merchandise on the wall is through colour blocking or creating a colour story. In Apparel stores colour plays an important role as in the end it looks good when displayed. Color Blocking is an easy way of making the most basic and hum drum merchandise look appealing. It only requires placement of merchandise based on its color. Divide the colours of products into groups, according to their colour intensity. Bright, pastels, Mid tones, Jewels tones, Dusty, Earthy tones, Neutrals. Color blocking is always done vertically. This is done so that the customer can see a variety of color options available tohim/her. Combine the colours within each group to create a colour scheme. Colours of the same intensity blend together. Color Blocking is done following the VIBGYOR, with the lighter colors on top and the darker at the bottom. Do not combine the colour of various groups together, expect for neutrals. This is the standard colour wheel that is a refrence for planning the colour scheme. Various colour scheme are shown on the smaller colour wheel. Fixtures Fixtures make the store attractive and communicate in a unique way. Every product/ merchandise looks more attractive when displayed over different fixtures. MBOâ&#x20AC;&#x2122;s have ample of products to show in their stores, ranging from apparels, to accessories, to footwear to lifestyle products. While observing these stores the most common types of fixtues seen in the stores nesting tables, picnic tables (for kids) gondolas, browers, D-rails. The most common browers fixtures used by the Indian retailers are the 2-way, 4-way, or 8-way browsers, and sometimes even use 16- way browsers. Fixtures in every country are accourding to the average height of the people in each country. In India, we have a maximum standard height of 5.6. Fixtures vary from company to company, says Anand, Area VM head, Westside. In addition to various types of fixtures retailers may choose from, each fixture is differentiated by its end use. Fixtures are usually based on the type of merchandise. These brands, to communicate whats in the store, have one focal point, talking about what product is in that section. Any MBOâ&#x20AC;&#x2122;s have a focal point which is at the entrance, would be highlighting on the mannequin, says Anand, Area VM, Westside. While observing the stores, during sales times or even when that style of merchandise has not been sold, they tend to display all the merchandise on one rail browser itself. These browsers canot take the weight of so many merchandise on one rail, and are chances to break or crack. As taken a customer feedback from the customers, it is noticed that it is difficult for the customers to find their size displayed on the fixtures as the merchandise are not placed sizewise. Most of the merchandise are not always withall the sizes so the stores mix all colours together which do not give a good feel to the store. So, I have come up with a procedure to show how merchandise are displayed on the browsers and tables. Displaying procedure for merchandise on browser display 1. The garments usually displayed on the browsers are cut sizes, or the remaining stock left from the previous season or theme. So if there are less than 100 pieces, each size is to be displayed on each arm. If there are 200 pieces, should display each brower with one size. Each merchandise is to be displayed pattern or colour wise. Each arm should have only 2/ 3 options with a capacity of 24 pieces. Each browers have a size talkers that mention about each size. Hanging Merchandise Through my observation by visiting the stores, I have noticed hanging plays an important in visual merchandising as it becomes eaiser for the customers to find their size or colour they are looking for. The merchandise colours should always be displayed from light to dark. Light being in the front, and dark behind, or light being on the left and dark on the right. Same pattern/style are placed together. Through a feedback taken from the customers, if the merchandise isnt placed size wize, the cusomers find it difficult to find their size and wastes their time looking for the right size. So, therefore it is mandatory to display the merchandise size wise: XS, S M L XL. Hanger Alignment The Hanger for each department varies. Like for the women and kids department they use a transparent colour hanger and for men they use a grey hanger. Behind each hanger there are codes written which tell which hanger is suppose to be in which department, told by Sabeena Kadam, Area VM, Max Each merchandise has different types of hangers: For tops, shirts, t-shirts have a shoulder hanger. Trousers, skirts have clip hangers. Dupattas have peg holders. This type of Hanger alignment is striclty followed in Max, Pantaloons, Westside, Shoppers stop store. Through my observations these hangers should not be tilting towards any side and should be parallel to the ground. The hangers should be equally space. To get proper spacing one finger spacing should always be kept. It gives a professtional look to the store. All the hanger heads should be aligned to one direction. This gives a neat and professtional look to the store, says Sabeena Kadam, Area VM, Max Fashion. Vertical Folding where the graphic or message is seen. Guidelines for gondola display As mentioned earlier, there are 3 zones, and gondolas fall in the B zone where either the cut sizes or discount sizes are displayed. On gondola’s these stores either display through stacking or by foldable merchandise. Gondola’s are either 4m or 6m long. Packed products like formal Shirts that don’t need details of shape, fit & fall should be stacked. 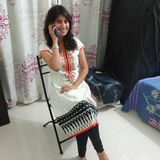 Ethnic kurties, Party wear and Fashion merchandise should be hung. A4 signage and shelf talkers are to be put on gondolas. Retail stores began to communicate through with the potential shoppers before they even enter the store. “MBO’s use enoumours amounts of graphics in their signages, be it a point of sale signage, or for during sales, or promotions. They use it to display their new arrival merchandise and their merchandise collection is seen through graphical signages”, Sachin Rana, Area VM An example, Max fashion store, during their EOSS window, to show the price pointd they used a sunboard to promote ‘sale’ which would be big enough for the customers to notice. These stores signages are mostly printed and not hand written. These stores have their logo on all their signages be it placed inside the store or in the windows. These stores use enormous amounts of graphics for during sales, back to college promotions, in window, indoor and outdoor signages. Their signages talk a lot about their theme. In this they are showcasing their products and through the graphical represention they are displaying their collection in the store. Designing the Signage While observing the signages in the store, the store manager had explained about the different signages used according to the fixture. A5 signages are used on table tops or gondolas, Table mounted signages are used on wall fixtures for denim mainly. 2. 7*11inches, 11*14inches. These sizes are primarly used for fixture signing. The Right Size of a Readable Text from a Certain Distance The signages in the store should be big enough for the consumers to read even from a distant point. If planning to put a signage abouve a gondola, or nesting table, the readable text is around 8â&#x20AC;&#x2122;. In addition, avoid using cursive and other fancy font styles for long sentences and smaller text sizes because these cases lessen the readability of your materials. The selection of the font is written using the same font for all the signages. Lighting is another device used to draw shoppers to both the interiors and windows display. It is essential in calling attention to merchandise in a display. Retail lighting has more functions than just illuminating the merchandise or showing where the location of the cash register is. All the stores have fixed lighting. Some stores use CLF lighting in their stores to highlight their merchandise as it is copartively cheaper. Stores like Pantaloons, Westside, Max Fashion, have focussed lights on their merchandise. These stores uses Ambient lighting in their stores. Accent lighting provides change from light to dark highlight to shadows. The Lighting used in their stores, these stores try to match it up to that of the international standards even though they do not have the latest lighting technology, says Varun Nair, Area VM, SHopperstop. LED lights are widely usd in stores too. â&#x20AC;&#x153;The right utilization of light is highly important for shopping environments. It can also be used to direct the path of the customers and to make them see various displays along the wayâ&#x20AC;?, Sabeena Kadam, Area VM Max Fashion. Deebya jyoti, Area VM, Pantaloons, said, â&#x20AC;&#x153; there is a rule to be followed a 45 degree maximum angle for lighting so as to not to place the light directly into the customers view. Stores like Max, Pantaloons, use focus lights in their windows to hightlight their merchandise on the mannequin. The lighting helps so as the lighting can guide the customer, reveal the color and merchandise, show the styling and tailoring details, and emphasis the qualities of the product, helping the merchandise to be pre-sold to the customers. It gives depth to the items and lights up the backdrop and props used. These stores are brightly lit from the inside, using recessed lighting throughout the store. Merchandised walls are lit separately from the stores overall illumination. Whenever a new merchnadise generally displayed on the wall, as the light which is on the ceiling always focus on the new apparel which is on the wall, said by Varun Nair, Area VM Shopperstop. An ideal store design will set tracking lighting into the ceiling 5 or 6 feet away from the merchandised wall. The fixture is always placed exactly vertically to the light, if not then it will create a shadow near the section and the merchandise would be in darknes. The new arrival merchandise is always displayed on the walls, as when the customers walks in the store their eyes automaticlly move to the wall. So, the lights which is in the ceiling always focus on the new arrival. The common type of lighting used in these stores are Ambient lighting, accent lighting and Focus lighting. Ambient Lighting is usually used for the show in a store which will make the store look bright lit, says Varun Nair. Accent Lighting is that lighting which is used throughout the stores. it reduced the shadows and the merchandise displayed on walls as well as on gondolas are brightly lit, - Deebya jyoti. Varun NAir, suggested few guidelines to be followed for Lighting as if the lighting is placed wrong the merchandise will be in darkness. Light should always be foccused on merchandise, and if the fixture is moved the light needs to be adjudtled accordingly to the fixture. Focus lighting is always used in windows so the merchandise is lit brighting and the customers can see every detail of the merchandise. Vrun Nair also mentioned, if the light gets dim or fuses of one must immediately change it, orelse the merchandise remains in darkness and customers wont bother looking at that area. Hair Must be clean, conservatively colored, styled and neatly combed. Long hair must be pulled back off the face. Contact of hair with hands must be avoided. Personal Cleanliness Adequate personal hygiene must be maintained. Precautions need to be taken to prevent unpleasant breath or body odour. Hands and Fingernails They are to be kept neat, clean and well groomed at all times. The length of the fingernails shall not inhibit job functions. No nail polish should be put. Shoes Must be polished at all times, and cleaned and in good condition with no holes and tear. Name tag / Photo ID The Company will provide a name tag to each employee at the time of employment. The name tag is considered a part of the uniform and is to be worn at all times by employees while on duty. Clothing It does need to be clean, pressed, properly fitted and in good repair. Must be clean-shaven at all times. Moustaches are permitted providing they are neatly groomed. Beards, goatees, moustaches, etc., are not permitted. Sideburns shall be neatly trimmed. If worn, it should be simple and business like. Necklaces should be worn inside the shirt and earrings should be kept small so as not to cause a safety hazard. Jewellery worn on the nose, tongue, eyebrows, lips or other unconventional areas of the body is specifically prohibited. Allocating space around a display builds both business and product credibility. It enhances the perceived value of the products displayed and gives it the respect it deserves. This window effectively conveys this to customers. Colour techniques such as minimising colour, creating strong blocks of colour and pulling together, always maintain a color story. Using different levels of lighting, this shop uses the brightest lights to bring the eye to a feature display. If your handwriting is less than perfect, opt for a printer. It adds business credibility and supports the products’ value. Provide enough directional signs inside your store and include the local language in your sign and signage system. 6. The signage’s and short and to the point. NOT THIS AVOID placing items that do not belong in a shop window! Do not Limit your theme to four! Avoid writing handwritten on signages as it does not give a professtional look to the stores. Do not use dim lighting in the stores. Do not use wrong signs with wrong items. Don’t reuse old sign holders. Do not put signs on top of signs. It gives a very unprofessional look to the store. Use props and communication to help you add to the story . 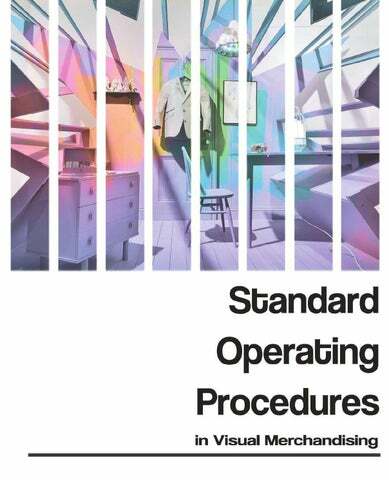 A standard Operating Procedure is a step by step manual to be followed in MBO stores.